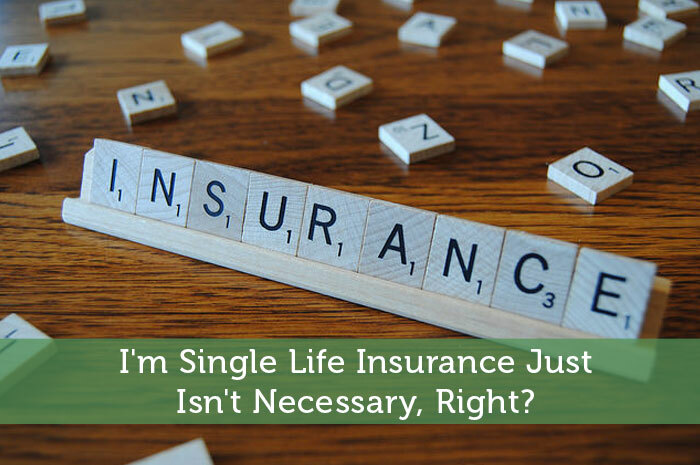 The following is a guest post about single life insurance. If interested in submitting a guest post, please read my guest post policy and then contact me. Necessary? No. Good for financial pre-planning? Perhaps. The answer to this question greatly depends on what you want for the future, how much that’s going to cost you later, and what kind of financial pre-planner you are. In this case, making a life insurance purchase right now would probably be an unneeded extra expense at a time where you’re probably just learning how to save money and take care of yourself. I’ve been in this position, myself, and sending any amount of extra funds out the back door towards something so far in the future just didn’t fit at the time. If you’re not even in a committed relationship, or even a relationship at all, then more than likely you can hold off at least a few years on making a life insurance purchase, without it making much of a difference. That being said, however, it’s a really good idea to recognize when those tides are changing and at what age life insurance premiums start to rise – there’s a sweet spot that can be found to set yourself up for less financial hardship later. This is a whole other phase of life and most of us don’t recognize it until we’re sitting at a wedding and this thought dawns on us – “this is something that I want”. Here’s that sweet spot that I referred to a moment ago and it’s important to pay attention to. At this point, you’re probably in a place where you’re more settled with life. Perhaps you have a career going, some money in the bank, and are starting to think about what you want over the next decade. If that includes finding a partner and starting a family, then it’s not a bad time to start considering a life insurance purchase. Let me clarify that it isn’t a necessary time to start thinking about life insurance – it’s only really necessary when you have a spouse and a child on the way that you are now financially responsible for. It can, however, be a wise decision – one that may save you hundreds of dollars per year right when you need that money the most. While you’re in your 20’s, even if you’re heading towards the later years, life insurance companies don’t see you as a risk – unless, of course, you’ve had any significant medical situations. Right now, it’s a safe bet for them that you’ll be around for a long while, paying your premiums, and therefore are very attractive to a life insurance company. They want you – and they’re willing to give you a great deal on premiums, because in the long run, it’s going to be a mutually beneficial arrangement. At this age and time, you can pick up a fantastic $500,000 insurance policy for $350 to $400 per year, which is way more than you really need at this juncture. This policy, though, will set you up for the next 30 years and any number of things can happen during that time. If you’re already thinking about finding a partner and settling down, then chances are that will occur within the next 30 years, right? Right. Everyone knows that starting a family isn’t cheap – there’s a lot of expenses that come along with sharing your life with someone and bringing babies into the world. The trick with life insurance is to not wait until it’s more expensive, right when everything else in your life is getting expensive. For obvious reasons, this is why a great deal of American families don’t have life insurance – it’s too much, too late. Within the life insurance industry, there exists a research outfit called LIMRA, which solely exists to collect information about the state of life insurance within America. As of 2012, one of their reports concluded that a whopping 64% of American families had no life insurance coverage whatsoever. When polled, families stated that the main reason they hadn’t made a life insurance purchase was simply that they couldn’t afford it. With the American economy having suffered greatly over the last few years, this really isn’t surprising, but the economy isn’t the only thing to blame. There’s also a substantial lack of education about what life insurance is, what it can do for a family, and what the consequences are, down the line, when tragedy strikes. One of the best possible things that you can do, even if you’re currently single, is educate yourself. Meet with a financial advisor, outline what you’re looking to accomplish over the next decade or two, and plan accordingly. Don’t take my word for it – do your own research and set yourself up for success. You’ll be surprised how easy and inexpensive it is to understand how your finances will change going forward and how you can experience huge payoffs down the road, through small sacrifices now. I’m Single Life Insurance Just Isn’t Necessary, Right? It would help if you discussed what kind of life insurance you’re talking about when you quote $350-$400 per year. Is this whole-life? Term? Generally I wouldn’t recommend life insurance unless you have some liabilities that you’re relying on future earnings to satisfy – or maybe as an estate planning tool, but this doesn’t apply to your average Joe. Basically you want life insurance to cover any liabilities that you’re worried would fall on dependents in the event of your death. These liabilities (or costs) vary depending on the need of each individual. Common ones are Home Mortgage, future child expenses (day-to-day stuff, college, wedding etc. ), wife’s expenses if she doesn’t work. It’s basically a “plug” on your personal balance sheet. And much like any balance sheet, you want to have positive equity (net-worth). Once you have a positive net-worth (including the present value of these future liabilities you’re worried about in the event of your death), you don’t need life insurance anymore. This is why I would only recommend term-life for these situations. So for illustrative purposes, let’s say you are 35, have a wife that works, 2 kids that are 5 and 6, and a home with a $150,000 mortgage. You would want to estimate what your family’s needs would be if you died today. So let’s assume your wife could be self sufficient and you won’t need to leave money to her specifically. You’d probably want the mortgage paid off, and enough money to raise the kids – for round numbers, say $50k each (sorry, they’re on their own for college). Total of ~$250k term-life coverage. Now let’s fast forward to you 20 years later. You’re 55, kids are out of the house, mortgage is paid off. You need $0 life insurance in this situation. You may have different priorities personally (i.e. leaving the kids some money, etc. ), but those are a personal preference. At this point you have positive net worth and life insurance serves no purpose. Focus on saving for retirement. Thanks for sharing your view Steve. That situation does sound like one where life insurance would make sense. Who would want to leave their loved one with a hefty mortgage to pay off. While it is a good idea to get an estimate of how much life insurance you really need, I’m sure it’s easy to give into more coverage than you need when the insurance agent compares the numbers for you. Sounds like some great coverage. It probably is best to leave it as is until more of your debts are paid down. I am (nearly) 28 and have a 250k policy for about $350 per year (not sure if Canada makes a difference). It’s a 25 year term policy to essentially cover my mortgage if anything should happen, not to leave my partner rich. Good point about insurance not all about leaving your partner rich but instead to avoid leaving them with any financial burden. I did a post on how you can calculate just how much life insurance you’ll need. Check it out here: Ensure You’re Not Over Insured. I’m sure it will be helpful to folks looking to determine just how much life insurance they’ll need. Thanks for sharing that Derek. You do want to do the proper planning and calculations before committing to life insurance. If not you could end up paying more each year than you really need to. I can remember in my early years when I was single that Life Insurance never even entered my mind. With getting older came more responsibilities and therefore Life Insurance became crucial. Just for my well being, knowing that the other half will be taken care of in the event of something disastrous is enough reason for me to get a good life insurance policy. Problem with getting older is the premiums start to stack up. Once you’ve paid off the liabilities, you can reduce the coverage and so reduce the cost when getting older. Yes I’ve barely thought about it myself, but now that I’m engaged I know it’s a matter of time before it’s something I should be looking into more. I’d definitely want my woman covered in case something were to happen to me. I bought a cash value policy while single in my twenties. The agents showed me the cash values that grew tax free inside the policy, and I liked the idea of locking in a low rate. Thirty years later I still have the policy. Sounds like you scored a great policy. It makes me think that maybe I should be trying to lock in a low rates while I can too. I was single when I first got life insurance. I think it’s still important, especially if you have a mortgage or a spouse. I just couldn’t see buying life insurance when I was single. There were just lots of other things that I’d rather spend money on instead of preparing for the future. I have life insurance through my work and I purchased a little extra on top since it only runs me about $30 a year for an extra 60,000 in coverage. I married though, and I have some debt, which I think makes life insurance a must have for someone like me. I think once my debt is paid off I will reduce the amount of insurance I have and start putting those funds into my retirement and other accounts. I don’t blame you for adding on that extra $30 a year. It is good that you are already thinking ahead with when you will be reducing your coverage and redirecting that extra money. I don’t have any dependents so life insurance is not really worth it for me. Instead I’ve got critical illness cover which will insure me against any critical illness like cancer or something else. I liked the guest post, thanks for sharing.